It is evident that the festival of lights will find many smiling faces embracing each other. Just to perfect the days better, LG’s Home Appliances will surely be one of your best companions. When your guests cheer over the sparkling crackers, your LG Microwave oven’s Charcoal Lighting Heater™ will serve you fine Indian tandoori dishes. Moreover, you will have to fret less about any adulterated sweets from the market. Flip through a cook book and indulge in delicious Indian sweets made by you and your friendly LG microwave oven. And yes, enjoy more ‘pakodas and gujiyas’ with the innovative DIET FRY™ feature that enables you to cook defried food with minimal oil intake. Your home décor will be all so new and fresh this year. From now on you won’t have to ever cross your brows over a less bright cloth. The all new LG top load washing machine has UNIQUE Jet Spray technology with the dirtiest of the clothes leaving dazzling after a wash, while allowing you to save almost 40% on energy and 70L of water per wash cycle! The total affair has got up in the finest ideas of festivities this year. 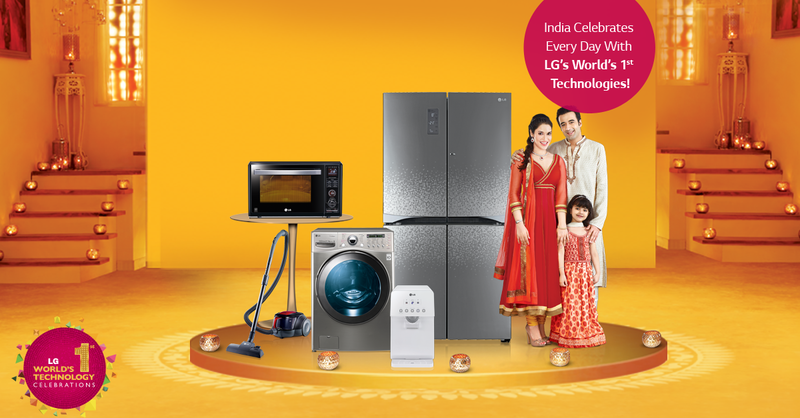 With technologies being pioneered by LG, this Diwali will surely bring about the much adored brightness in your life. Now that you reap the harvest of happiness from your LG Home Appliances, it won’t be too wrong to call them your magic lamp. Innovation beyond imagination. Now, it’s all possible. I had booked Washer Dryer model F1496ADP24 on 8th Nov from LG store from Kolkata, India, which was initially scheduled for delivery on 10th Nov.
Then a new story came up that the material on-board met with accident at Bihar Border while being dispatched from Gaziabad and hence getting delayed. Meanwhile we had to make number of phone calls to understand the delivery. We called them n number of times for an update but there were no proper update from LG. Finally someone from headoffice called to say that the product would reach by 1st Dec and delivery will be arranged on that day itself. on 2nd by initiating the refund process. Now it is already 2nd Dec and no product have arrived. They now have all guts to even say they do not know the refund process. Hope that this is read by a correct person who can take some action. We need official apology from LG. We had very frustrating experience with LG, they crossed all limit of telling lies. This is really disgusting on such a brand!! Hi, we are sorry for the inconvenience caused to you. Please share your concern with contact details and complaint no. We will look into it.